Being Buried in a Bacon Coffin is a Thing Now! How much do you love bacon? Enough to be eternally wrapped inside of a bacon coffin that smells like bacon? 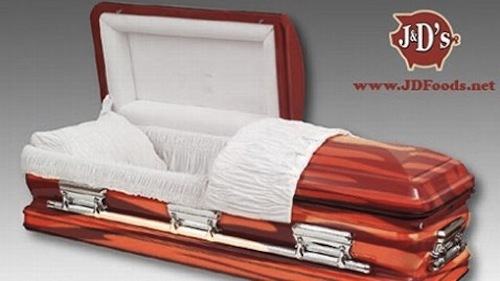 Well if you want to really tweak friends and family out when you leave or just make people shake their heads at you one last time you can purchase a coffin with a bacon paint job. The crew over at the ‘Everything Should Taste Like Bacon’ blog have created just that and you can snag one from their site for about $3000. You might want to toss in a little extra for multiple air fresheners. Posted in Weird Deaths | Comments Off on Being Buried in a Bacon Coffin is a Thing Now! 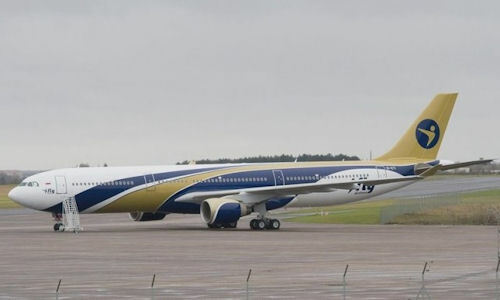 Man’s Frozen Body Makes Seven Trips in the Wheel Well of Russian Airbus! Since Russia is like the overseas equivalent of Florida, news that typically comes out of there is usually skewed toward the weird. After finding blood splattered near the wheel well of an Airbus passenger plane, authorities moved on to their second what-the-hell discovery…a frozen 22-year-old dead man stuck in said wheel well. This same 22-year-old was not only dead, frozen and stuck in the wheel well of an Airbus…he’d been there for four days and logged at least seven trips before he was discovered! Giorgio Abduladze’s t-shirt and shorts-clad body underwent an autopsy showing that he froze to death in flight. Crews don’t regularly access the area where Abduladze’s body was found but now everyone’s wondering what he was doing in there in the first place. Posted in Weird Deaths | Comments Off on Man’s Frozen Body Makes Seven Trips in the Wheel Well of Russian Airbus! You are currently browsing the archives for the Weird Deaths category.